The main floor’s airy open floor plan includes living, dining, and kitchen space, plus a full bath and bedroom #1 is a cozy daybed room. Enjoy the fresh new look for 2016 with brand new carpeting and paint throughout. The Second floor offers 3 bedrooms and 2 full baths. Bedroom #2 is a Large master suite offers a new king bed, full bath and sitting area with flat screen TV that includes a futon that can be used to sleep 2 more, plus access to large 2nd floor balcony. Bedroom #3 sleeps three with one full and one twin bed. Bedroom #4 sleeps two with 2 twin beds, great for children or two adults who’d prefer separate beds. This large home is equipped with dual thermostats that can control each floor to keep it comfortable on all levels. Enjoy outdoor relaxation on our ground floor wrap around porch, back deck, large upper level balcony, perfectly relaxing fire pit, or inside with Netflix through the provided BlueRay player. House offers a fully stocked kitchen, golf cart for seasonal use and beach wagon, patio furniture, gas grill, 2 flat screen TVs, DVD player with Blu ray, additional DVD and VCR, high speed internet, beach toys, family friendly movies, games and books. Shenanigan’s is in the middle of Beachwalk’s activities and steps from wonderful children’s park. Spots for 2 cars out front, and 1 to 2 in driveway, with overfull parking lot half block away. Enjoy our family friendly resort amenities: private boardwalk to a gorgeous stretch of Lake Michigan, golf cart parking across the street from the lake, inland Lake Kai with kayaks and paddle boards, heated resort pool and bath house, fishing piers, tennis, basketball, and volleyball courts, putting green, bike rentals, and resort concerts and family events. Venture out to the surrounding communities of Sheridan Beach, Long Beach, Michigan City, New Buffalo, Beverly Shores, and Chesterton for community events, festivals and concerts, golf courses, local zoo and splash park, lighthouses, marinas, Outlet Mall, shops, antique shops, great restaurants, community theater and arts, farmers markets, wineries, bike trails, nature centers, and beautiful beaches. A vibrant resort, beautiful Lake Michigan beaches, nearby natural areas of Indiana Dunes National Lakeshore and Indiana Dunes State Park, and charming lakefront communities make this a wonderful place to visit year round, and a hit for all ages and interests. Close to South Shore commuter Rail, and within one hour drive of downtown Chicago. Saturday to Saturday rental during the summer weeks, outside of the summer weeks, a 2 night getaway is welcomed! Summer rentals (Memorial Day to Labor Day) Include a 2 seat, 4 person golf cart for use during your stay not available during the off season. No smoking, no pets. This home includes a golf cart in the rental. I had a fantastic time at Shenanigans celebrating my 50th birthday with girlfriends. The house was perfect for us. The golf cart made the trip to the beach so easy. The only complaint was the quality of bath towels, linens and paper towels. I expected a little higher quality for the price we paid. Everything else was fantastic. The reservation process, check in and check out procedures were very easy and simple. We had a great rental experience and would definitely rent again and recommend the rental. The house was as advertised; very roomy, comfortable and clean. Everything was in working condition. Absolutely no issues with the house. The location was good: within a 5 minute walk of the pool and a 12 minute easy walk to the beach. A Golf cart was part of the rental so getting to the beach was very easy and quick. The beach is awesome. 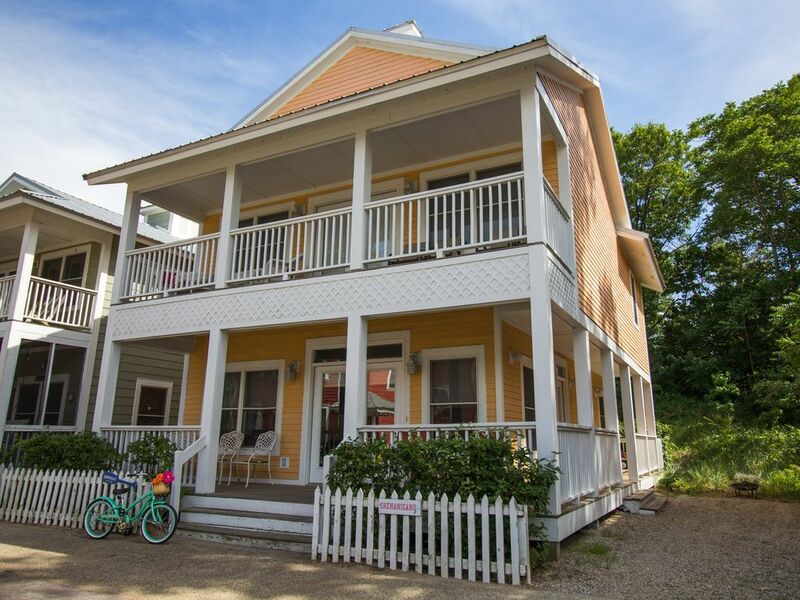 The house is situated in a small beach community; very charming. A Perfect Little Get Away! The place was charming! It had a nice porch and a beautiful balcony off the master bedroom. The golf cart was a fun and useful addon. If I had a complaint was that the master bedroom was huge and even had a futon that could sleep two more people. The two other rooms upstairs were pretty standard and the 4th "bedroom" downstairs was tiny. It may be workable for a child but really tight for an adult. We loved the pool, the beach, the gas grill, etc. air conditioning was not working and kitchen was filthy. We contacted the office and both were fixed. The 1 bedroom was extremely small, more like a closet than a bedroom. Area is lovely and the lake was exceptional. We will come back again, but will rent another property. We had a great week vacation and Shenanigan's. The home was clean and spacious. We vacationed with two families and there was plenty of room for all of us. The kitchen was well stocked. Beachwalk is a great resort with so many activities. Our kids that ranged from 3-12 years old all had a great time at the beach, pool, fishing pier, paddle-boarding, and golf cart rides. It's a great place for a family vacation. Great house for what we needed. This home is managed by Beachwalk Vacation Rentals with a 24 hour full time staff available your entire stay.